The elder tree blooms from mid May through to early July – big saucer-shaped clusters of tiny flowers. You’ll find them in almost every hedgerow. 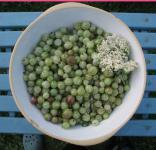 Elderflowers impart a wonderful flavour to homemade cordials, wine, sorbets and ice creams. Their sweet and bitter flavour meld wonderfully with the tang of green gooseberries that also come into season in June. 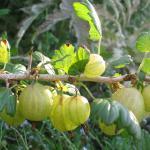 You’ll find gooseberries in farm shops and local green grocers across the region in June. But if you've a sunny corner in your garden or allotment for this untidy bush, put one in – they grow very easily. Pick large white flower heads. Make a thin pancake batter and heat about half an inch of oil in a frying pan. Holding the flowers by the stalk and dip them into the batter then cook in the oil till light brown. Sprinkle with caster sugar – flavour with lemon juice or cinnamon if liked. Wash the gooseberries, put them in a pan and heat until they start to cook and give up their juices. Add the sugar and lemon rind and stir until the sugar is dissolved and you have a pulpy mess. Add the elderflowers and continue to cook for a few minutes. Allow to cool then push it through a sieve. Taste and sweeten with caster sugar if necessary. Blend with creme faiche or cream. Put it into separate serving bowls and chill in the fridge for a couple of hours. Serve with mint sprigs, and a biscuit or two. Lovely. 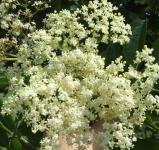 Pick the elderflowers when they are fully open and on a warm day. *You’ll need some equipment and specialist ingredients to make wine. Local home brewing shops and internet suppliers on recipe sheet. Each bottle will cost you about 30-50p to make. Start saving wine bottles.